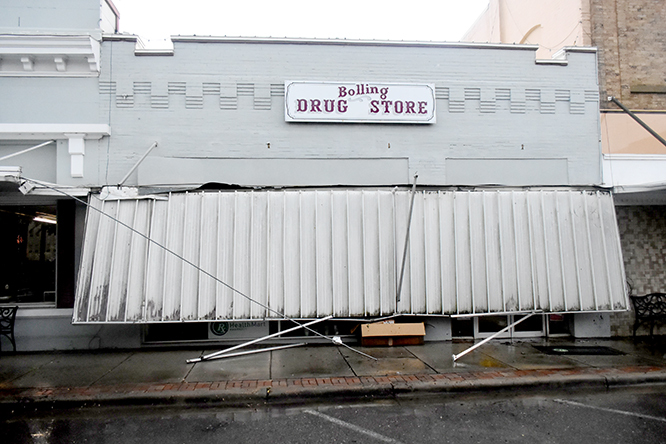 This awning fell at Bolling's Pharmacy during a thunderstorm on Aug. 17. A sudden flash thunderstorm at approximately 4:15 p.m. on Friday, Aug. 17 sent this heavy metal awning crashing into the front of Bolling’s Pharmacy. The awning apparently fell due to a sudden strong wind burst generated by the thunderstorm. Fortunately, the awning did not break any windows and no one was hurt during the incident.